The high-achieving, academic-minded students at the Killeen ISD Early College High School are expressing themselves in poetic word and visual art. 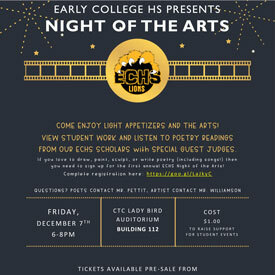 The school’s first Night of the Arts is 6 to 8 p.m. Friday at the Central Texas College Johnson Fine Arts Center. A $1 admission fee will go toward funding student events. Light refreshments will be served. Early College English teacher Chad Pettit said many of his students expressed a desire for creative outlet so he worked with the Killeen ISD Early College staff and colleagues at CTC and Texas A&M University-Central Texas to plan the event. The Night of the Arts will include a gallery walk of student visual artwork and poetry readings. The Early College is in its fourth year and celebrating its first graduating class. Freshmen and sophomores attend a campus on Fort Hood and juniors and seniors attend the CTC campus. Students can earn their high school diploma and CTC associate’s degree simultaneously. Looking to get the word out about the art event, Pettit and four sophomores contributing poetry or visual art to the cause gathered to talk about the importance of artistic expression. La’Quaje Bradley, Jayla Gittens, Taylynn Burks and Arianna Mendoza explained that they wanted the community to learn more about Killeen ISD’s fifth high school and they wanted to take the courageous step to display their own work. “I want people to see what I can do and I want to get feedback,” said Gittens, who plans to display photography and drawings. “We’re trying to put ourselves out there,” said Mendoza. She explained how art can express the inner tensions we all feel and can be a means of facing fears. “We are an academic school, but we want to show we can express ourselves,” said Gittens. Combining high school and college is a rigorous undertaking that requires serious study and some students even use club time to work on academic skills, students said, making an evening of artistic expression even more important. Guest judges are scheduled to provide input for the artists.